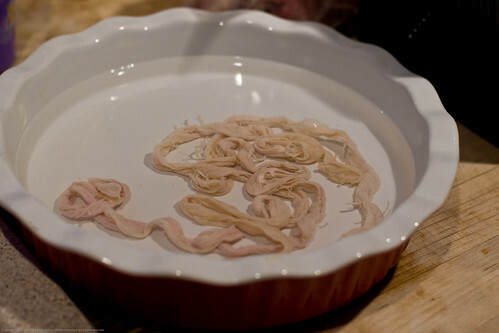 When I went to see Sandor Ellix Katz speak about Wild Fermentation (Sandor Ellix Katz and the Wild among us) I heard him mention that he was getting into wild fermented meats. 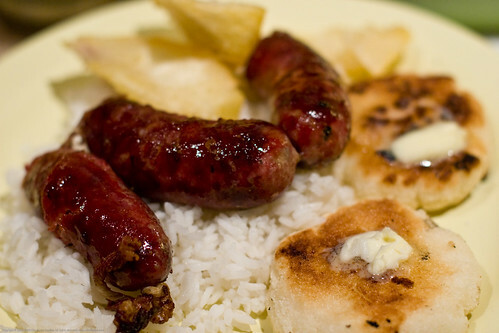 This reminded me of my childhood when we would make Colombian fermented sausages called salchichas or chorizos. I wrote to Sandor about this recipe, I think he will enjoy it as he is quite an intrepid culinary explorer! 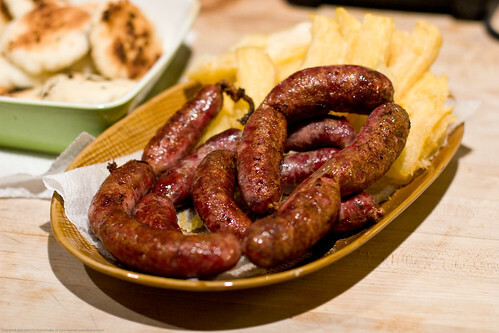 Besides, these sausages are just amazing! At first, the idea of fermented meat might seem revolting or alien to Americans – we are constantly bombarded by Big Ag, USDA, and FDA message about cooking meat until charred (but not to on the other FDA hand because char = carcinogens). We hear about the woman, in the New York Times, who was poisoned and then paralyzed by the E coli in her cheap and utterly crap hamburgers from a big box store (E. Coli Path Shows Flaws in Beef Inspection). She got a strain of E coli that is a product of CAFOs that Industrial Big Ag, the USDA and the FDA works so hard to protect. Had she eaten free range grass fed beef from a small producer she would still be teaching dance to little kids. Its not a philosophical or economic thing – its a biological thing. The profoundly unhealthy diet of a CAFO steer encourages the human-toxic E coli while grass fed steers do not (its a matter of rumen health, bacterial ecology, and proper pH). Thats all about bacterial issues that arise in the living animal. There are also issues that can arise in foods that have been contaminated after butchering from bacteria in the ambient environment. As I just mentioned, our modern CAFO environments contaminate our meats with super bugs that we have not evolved to manage. There are also bacterial species that will colonize your food (raw or cooked) that come from your local environment. In environments where such foolishness are not the standard, like Colombia, the meat is not pre-tainted with these toxic bacteria (also, obviously, meat you source from ethical farmers who feed their steers the correct diet of grass, 100% of the time). Remember that Colombia is a tropical country, it is also considered 3rd world. When we lived there, back in the 1960s, it was certainly quite different from the US. My mom, who is American – a Illinois farmer’s daughter, tells of how the meats in the market would be hung out in the heat, without refrigeration, with insects buzzing about it. If you watch No Reservations with Anthony Bourdain, you will often see shots of meat markets just like this. Meat isnt left out like this for long. They butcher enough for that market day. Needless to say the meat was already beginning to ferment before you bought it. Fermenting is the same as aging. When you buy expensive aged beef, its beef that has begun to ferment. This fermentation is essentially the same as that you find in pickles, cheese, sourdough bread, etc. The main bacterial species is the lactobacillus. This bacteria begins to digest the food and a waste product (we in science call it a metabolic product) is lactic acid. This lactic acid acidifies the food and then inhibits other human-pathogenic bacteria. Lactobacilli have been our friends from the beginning (pre-modern human to be certain) and it continues to help us when we make our traditional foods. 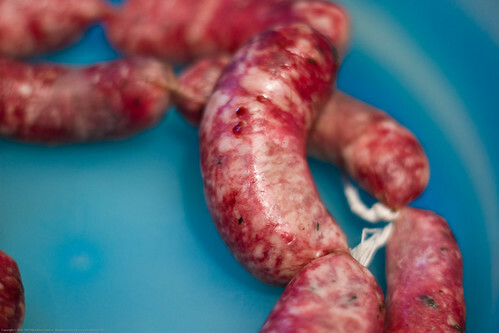 The sausages I am writing about today have an enhanced flavor BECAUSE they are fermented or partially digested by lactobacilli. 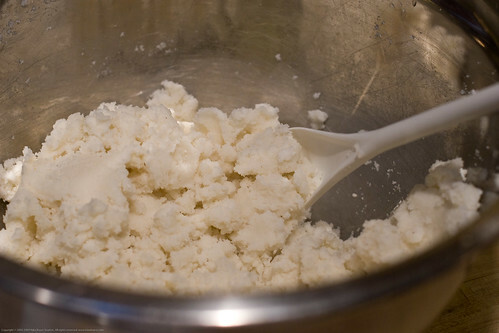 If you would like to try this recipe without the fermentation step, it will still be delicious but it will not have the characteristic tangy flavor that the lactic acid brings. I remember my mom and my grandma making this when I was a child. 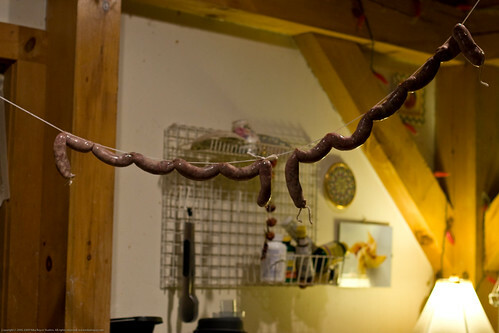 I remember watching them string the sausages up high in the kitchen. I can see in my minds eye the sausages hanging there and how I felt so fascinated by it all. I also remember how delicious they were. When I mentioned to my mom that I wanted to make these, she surprised me by sending me a meat grinder and then pork casings! The sweetest part of this all was having my three kids at my side, peering over the edge of the counter in the case of my 3 year old son, watching me use the grinder and watching the meat filling up the casings. They were not grossed out, they were fascinated and they all wanted to give it a try! It melted my heart, it was a perfect moment for me. This is the recipe as I got it from my mom. I thought I would share the way she wrote it because it sounded great! 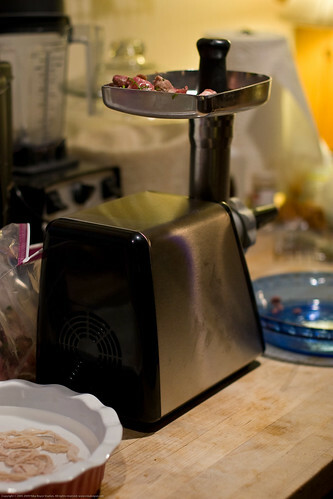 As I remember, in Colombia, the meat in the chorizos were very finely minced by hand…however, I think you can do this with the food grinder attachment. Even when I grind the meat in the grinder machine, I used the coarse blade so that it would mimic this “hand-minced” meat. (The kind we used to hang in the kitchen! Mix everything together, except the casings. Put it in the refrigerator for a couple of days. (I like longer for the tangy taste…but if you’re weirded out with aging meat, don’t do this). Then comes the tricky part, filling the casings. If you have the sausage making attachment to the machine, this is a piece of cake..if not, you have to do it by hand..I’ve done both. 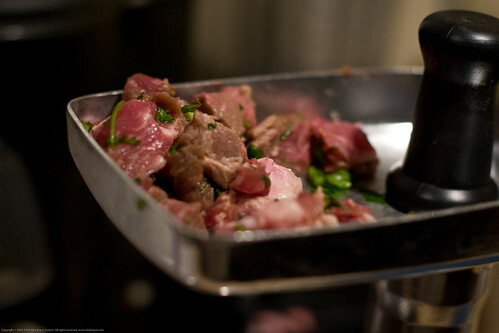 Chunks of meat, just before being fed into the grinder. 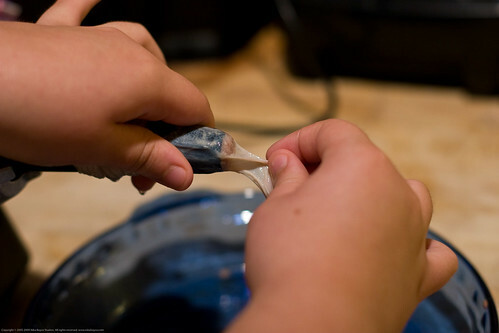 Fill the casings with the mixture, giving it a couple of twists with every 4 or 5 inches. When done filling, stab each link with a toothpick to let it release air. To do this, you need to slip a length of casing onto the sausage tube attachment on your grinder. 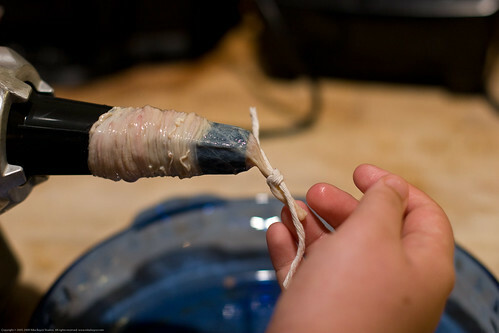 When you come to the end of the sausage casing, tie it off (string or with casing) and then make links by twisting. At this point you can make them or you can age them. To cook them, put them in a pan, cover with water, bring to a simmer, simmer until the water is gone (might want to flip them at some point) and then allow them to continue to cook/fry to caramelize the outside. 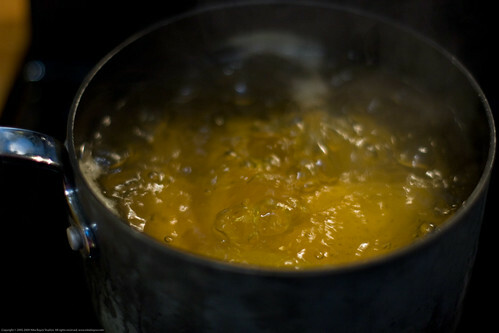 If you are ready to go to the next level to get that unique tangy flavor, you do not cook them but you hang them up. Hang the links on a clean twine in a nice cool airy place for a day or so. After a day mine really had no odor at all. They were drier, perhaps shrunk a bit, concentrating flavor for sure. 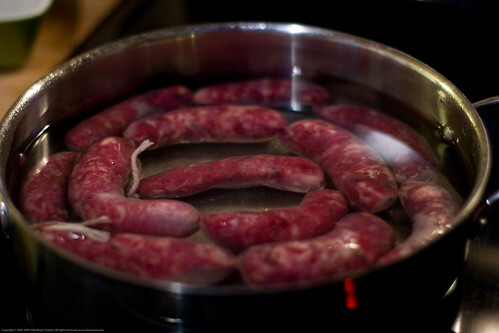 Like before, you cook them up like any other sausage…first with a little water in a fry pan with a lid, then let them brown. We also made arepas and yucas fritas (fried yucas) as well as rice to go with this. 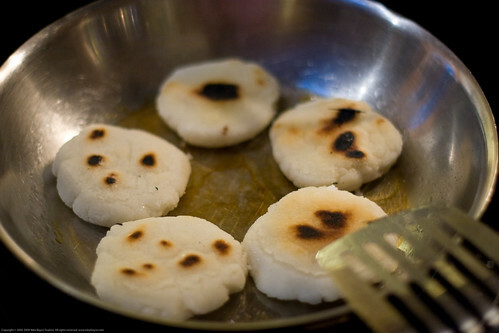 Cooking arepas in the pan. They then go into a 400 F oven. 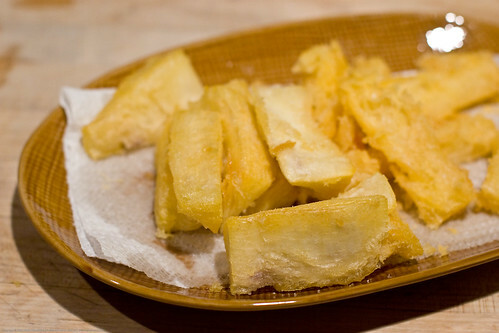 Boil frozen yucas 20 minutes (MUST DO THIS). 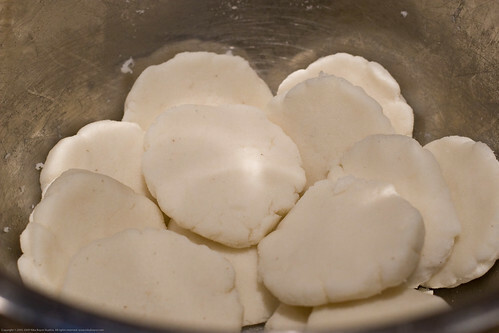 Remove yucas from water, cool and allow to dry a bit, then break chunks up into bite sized spears. 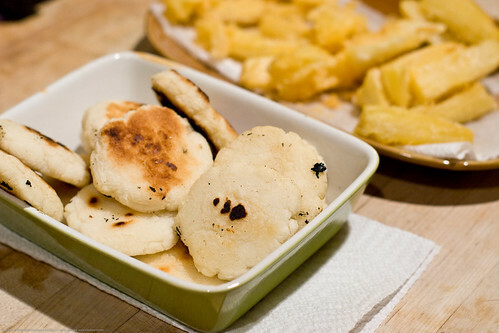 Delicious arepas and yucas fritas are our sides! It would have been more correct to also serve this with lots of cilantro, avocados, lime, etc but I didnt have those things! 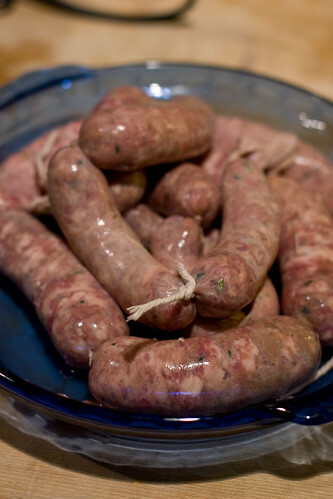 As an aside, after I posted the photos of these sausages on flickr I got an email from someone asking to order 200 of them! I guess thats the ultimate compliment! You have a fantastic blog! I have lived in the US since I was 3.5 yrs old so I am still exploring Colombian food – the newer concepts like Colombian hot dogs are outside of my experience! Consider the colombian food I know a snapshot from the 1960s and before. Its wild that your DH is a vegetarian – the only thing harder than a vegetarian colombian, I am guessing, would be a kosher jewish colombian! 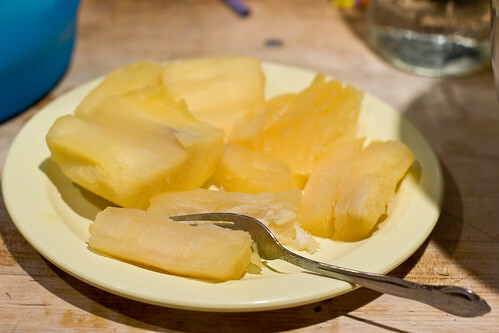 That said, the fact that Colombia is equatorial means that there is a great bounty of vegetables and fruits! Am looking forward to learning from your recipes! Hi to both of you – Nika and Erica. So, needless to say I enjoy all your posts…there aren’t too many Colombian food bloggers from what I can find. Yeah, my traditional recipe doesnt have onions, at all. They taste authentic to me without the onions (which might overpower the rest of the flavors) but there is no reason for you not to try it with the onion! 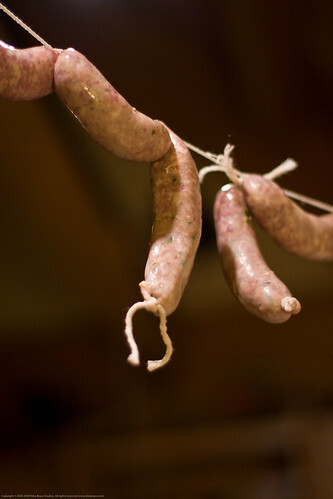 There is no way to compare storebought sausages to homemade ones because they use poor quality pork and additives like MSG (your package calls it “spices”) while homemade ones are pure and simple. Especially the fresh cilantro, you can not do that in a commercial product. If you make some, let me know how it goes! tbs for oregano (both fresh)? 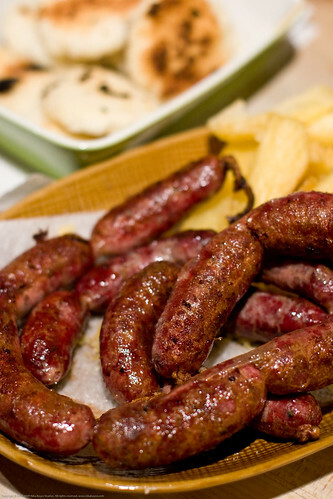 this is the only recipe of chorizo that you know for colombian chorozo? What fun to read this article. 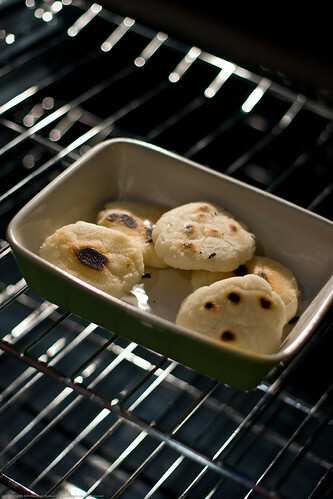 I grew up in Cali and I remember vividly the delicious chorizo and arepas we used to buy on Avenida 6a across from the movie theater and the Ventolini Gelato ice cream shop. Amazing food. I am American but after spendng all of my youth in South America I tend to cook a lot of the foods of Colombia and other Latin countries frequently. I am going to have to try these sausages out. Thanks. Sorry it took so long to reply – whole family has been sick. 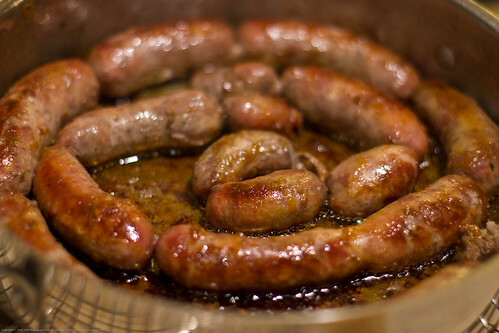 If you don’t cook all of those sausages right away, how do you store them? Leave them out indefinitely? Freeze them? We brought my daughters home from Bogota 5.5 years ago, and they love all food. This would be great to give them a taste of their birth home. Thank you! Please dont leave them out indefinitely! As we are talking young kids – please cook these fresh. Experiment with the aged ones on older people. I do not know if one can freeze these and not have problems with them drying out from the process. I try to make enough to last a couple of meals. 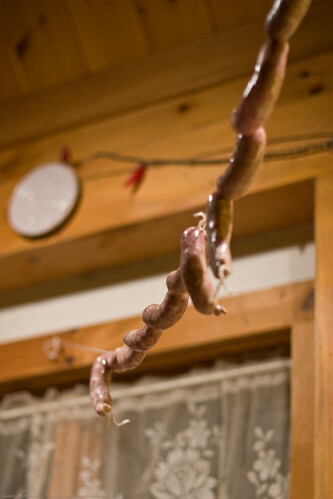 The sausages, fresh, can be in the fridge maybe a day or two longer. They are not that hard to make if you have the grinder. I recruited my son who likes to cook. I recounted stories of his Colombian grandmother, who died when he was very little (He’s 20yr old now)while we worked together. When my son and I sampled the first tamale. He got up and embraced me with hug and said, “We did great, mom…this is so ‘rico’. Dad is not going to believe it!” I was delighted with the outcome. My husband was so surprised…. the tiredness of the day dissolved from his shoulders. I felt such affection. 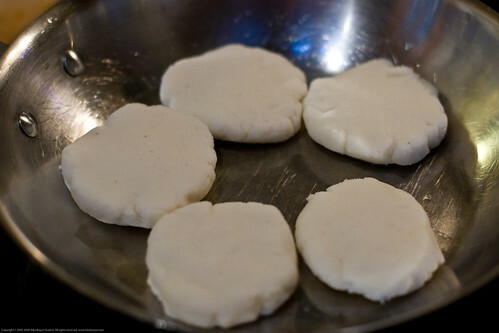 Tomorrow, we are making Empanadas. Goodness what a touching story! I am so happy I was able to make you feel comfortable enough to make the tamal! I hope the empanadas turn out well for you all!